Often times we are making tough decisions at the WR or Flex spot on our rosters. This tool is a great tie breaker. It tells you which guys have fantasy production that is most reliant on scoring a touchdown. Touchdowns are hardly predictable, so in a close call it’s always safer to go with the guy who produces naturally with minimal reliance on scoring. When those type of fantasy players score, it’s just a big bonus. A.J. Green relies on touchdowns just a bit more than average. This is great news for the #1 fantasy receiver. His value should hold strong. Brian Hartline’s rank is boosted by one big performance. He is still a solid start every week. The guy get his targets and yards. You can play him as a #2 but he is an amazing #3 fantasy WR. Mike Wallace, Julio Jones, and Steve Johnson have been scary dependent on touchdowns. DeSean Jackson, Reggie Wayne, Jordy Nelson, Wes Welker, and Brandon Lloyd don’t need to score to be good fantasy options. Promising news for these players fantasy future. Malcolm Floyd is a solid #3 WR. *Blue indicates a promising touchdown dependency ratio. Blue is good. 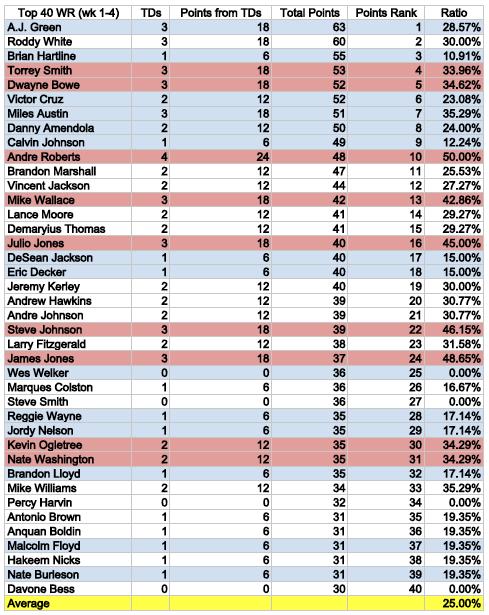 ** Red indicates players who have been overly touchdown reliant. Future inconsistency is predictable. You might consider trading guys in red if they had a good game last week. +Chart 2 is sorted in ascending order of touchdown dependency. The lower the ratio the better. *Green is good, like money in the bank. This means a player has a good TD dependency ratio relative to his points rank. 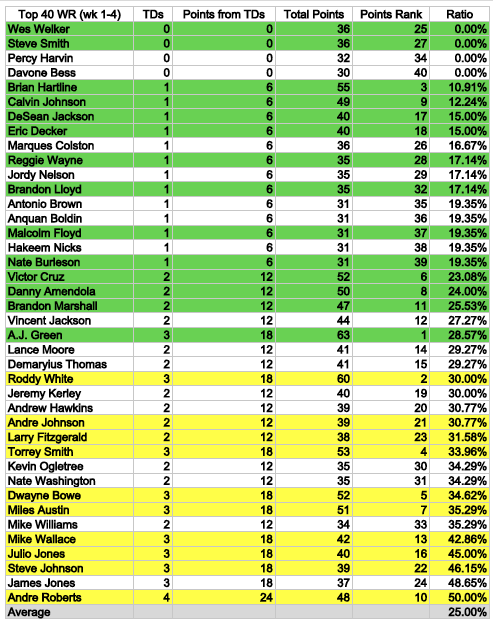 **Yellow represents players with alarming TD dependency ratios relative to their points rank.